Following on the previous post, here are my favourite dishes which I made for the first time in 2010, followed some year-end musings. 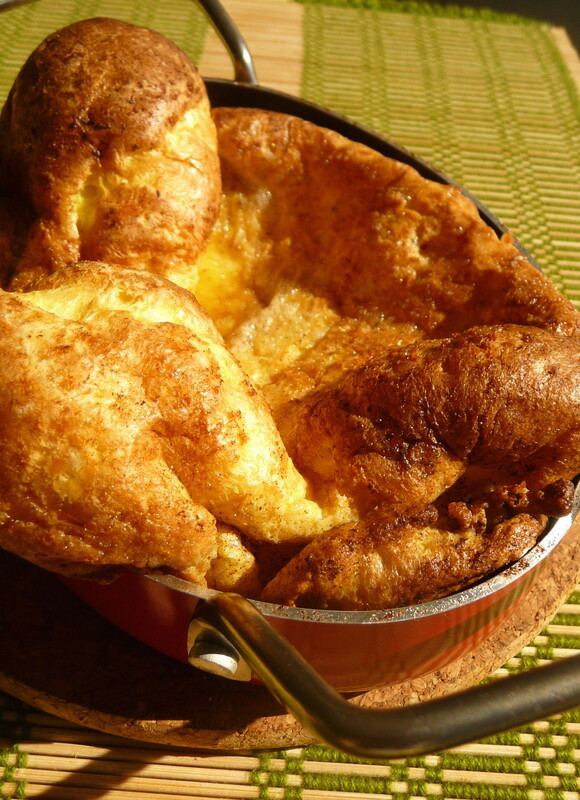 What cookbook would you take to the hypothetical desert island? I would have to lug my tome, New Best Recipes, from America’s Test Kitchen. I consult this indispensable volume more than any other of my hundreds of cookbooks. In fact, I just did their zucchini bread recipe in my last post. Their pesto recipe is simply outstanding. ATK is so thorough and creative in testing the many permutations, techniques, and varieties of ingredients to create the ultimate recipes. 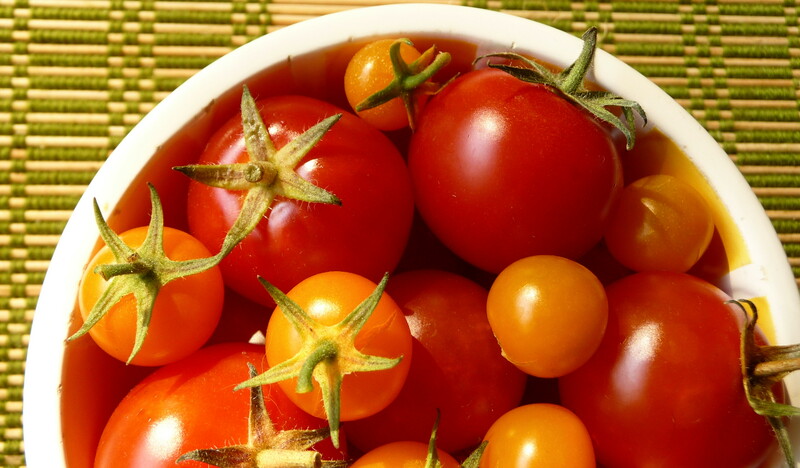 Sometimes they are a bit fussy, but this is based on their experimentation to produce the best taste, texture, and finished product. One thing I do find is that their recipes tend towards the less hot (spicy) side, so I often will up the heat or add a bit, when I feel like it. 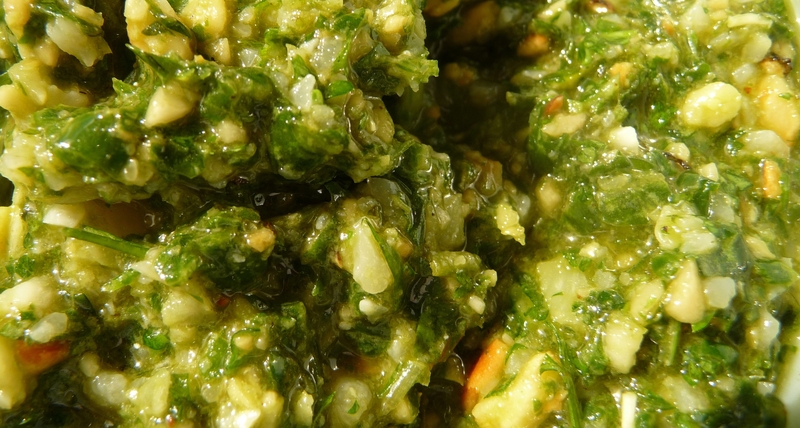 I had made a few recipes for pesto before trying ATK’s, and this one really is best. Toasting garlic and nuts adds a bit of time, but it is worth it to highlight the flavours, creating depth, subtlety, and nuttiness – what more can you ask for in life? 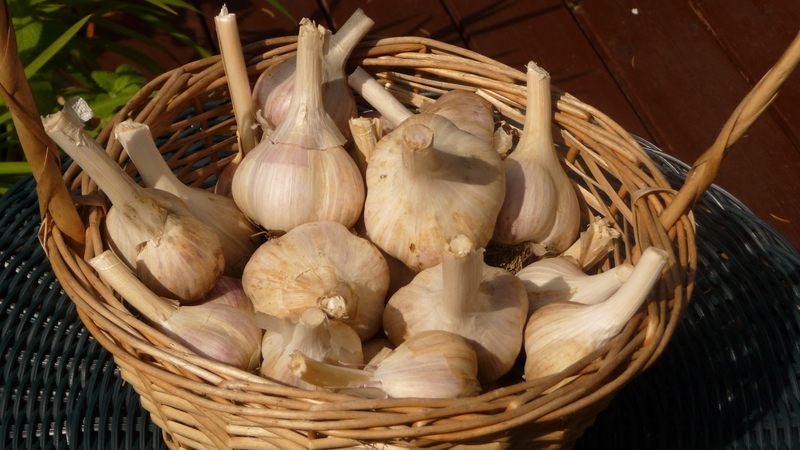 On our island, we have a garlic growing cooperative, and I was able to participate in a couple of sessions (prepping, cultivation, planting, weeding, harvesting), which gave me 40 bulbs of organic Russian hard-neck porcelain garlic – if you really want to know the variety. It was an interesting experience, and I now have quite a bit of garlic for the upcoming colder months. The basil we have been growing on the deck (it is not deer-proof, though it is supposed to be) has been doing well the past few years, with our southern exposure. 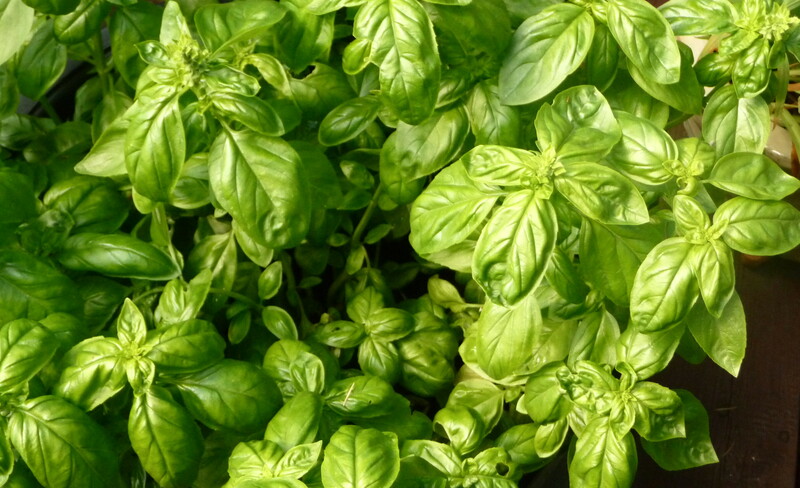 Around this time of year, I have plenty of basil – and combined with a bounty of garlic – making pesto for the winter is a good idea. 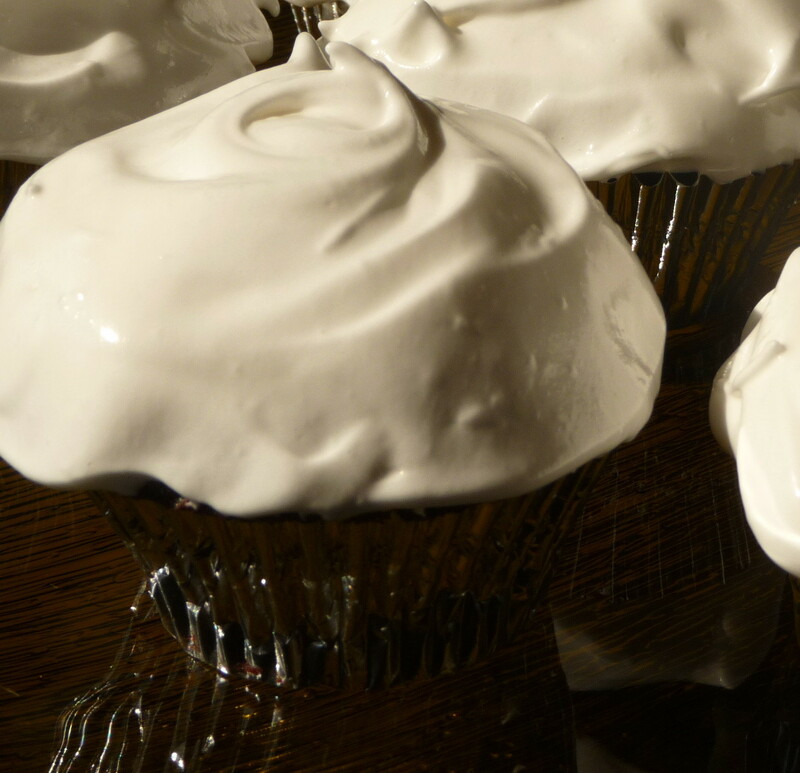 So I tripled the ingredients, and the three batches went along much more quickly than doing each one separately, of course. Red, gold, and green, red, gold, and green. Huh? What exactly does that mean? This is from an era of many pop songs with memorable refrains but not much meaning: the 1980s, of course. The song was very catchy but did not really have the “deeper” meaning indicated by the references to “karma” and the changeability of the chameleon. There is good alliteration with “karma chameleon” together, while “red, gold, and green” make a nice vivid trio of colours. But does the song really say anything, other than just being a fun tune? 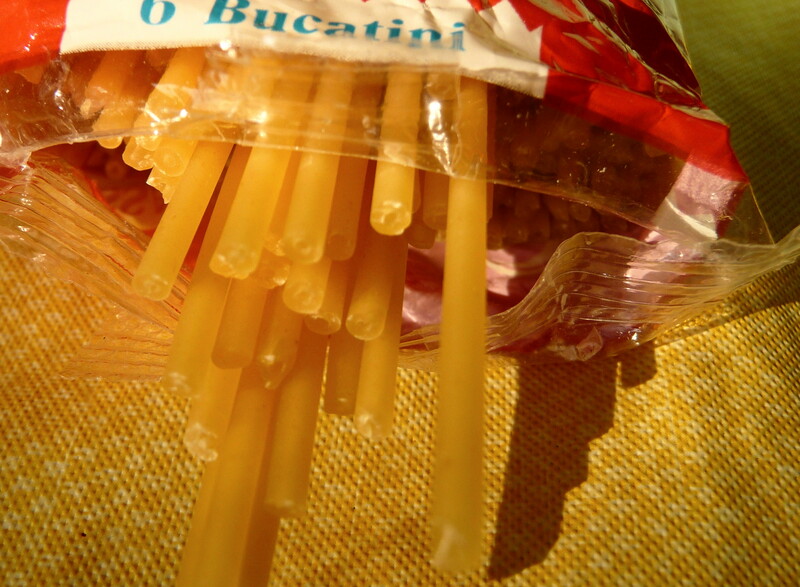 Like the song, bucatini is a fun pasta. 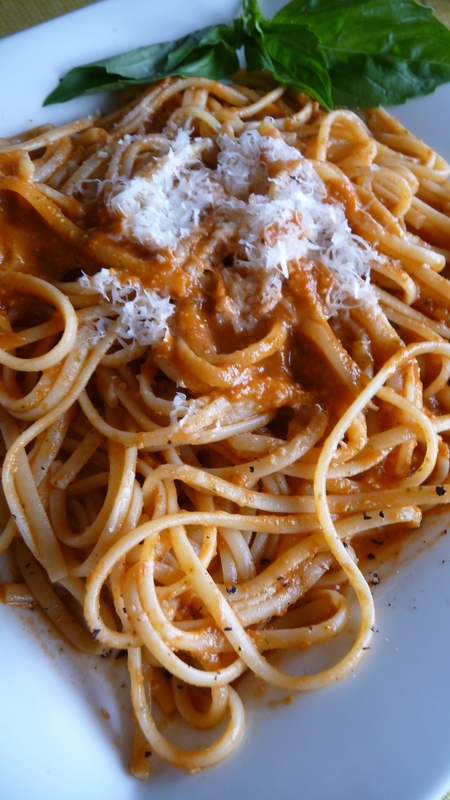 However, it is not always easy to find bucatini in your grocer’s shelves, nestled among its more popular cousins, spaghetti and linguine (do not even try to find “buca-what?” on a small island like this one). 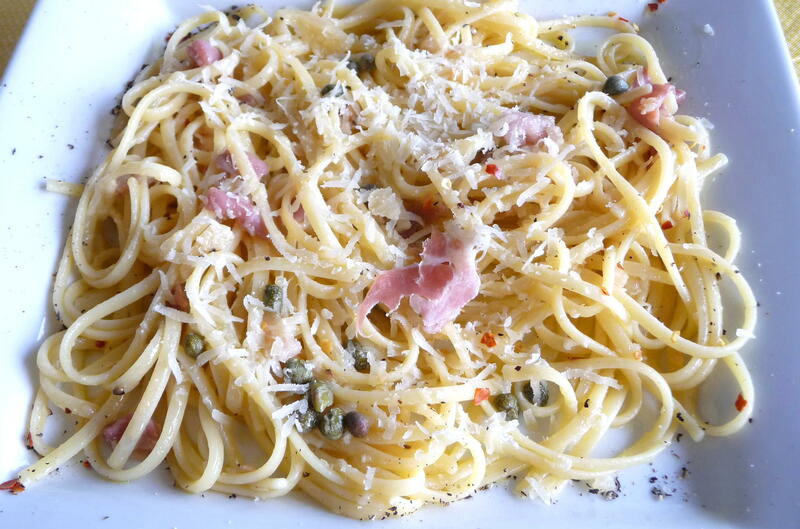 Bucatini is like a drinking straw, with a hollow centre, a kind of tubular spaghetti, which provides, a nice al dente contrast to the warmed cherry tomatoes, and good textural counterpoint to the light olive oil-butter sauce. 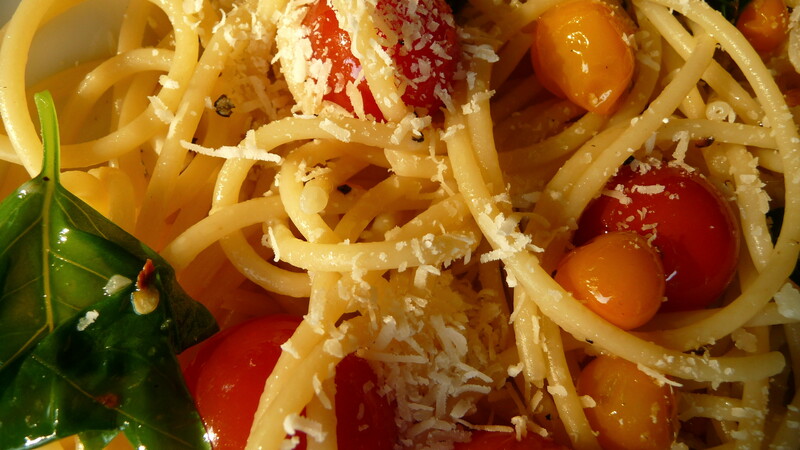 My inspiration for combining bucatini with cherry tomatoes comes from a casual dinner a few years back, hosted by friend and fellow island blogger, Lynn, of Real Food from a Small Island. 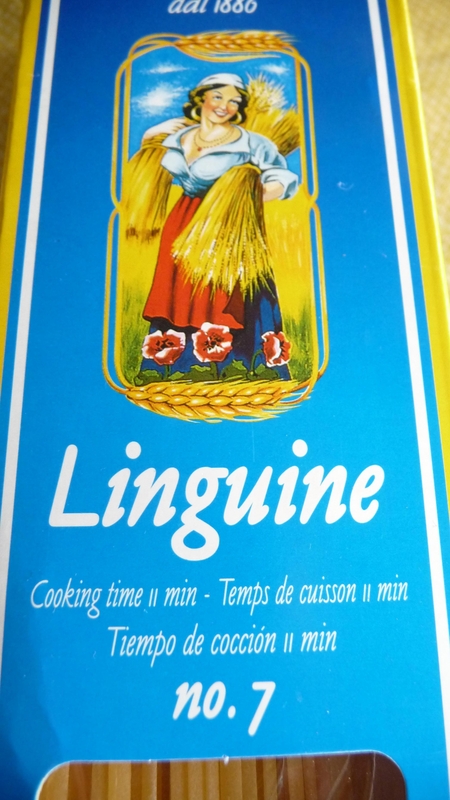 Lynn’s sauce was delicious yet somewhat different from this recipe. 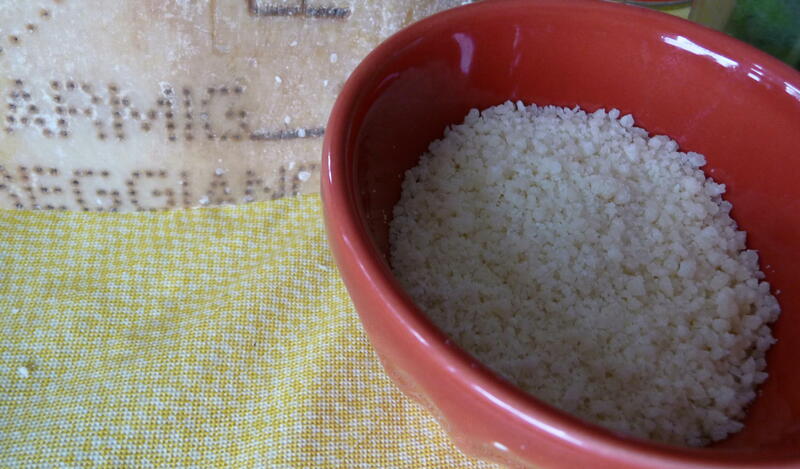 I like the classic Italian base of garlic-olive-oil-black-pepper-and-Parmigiano-Reggiano. 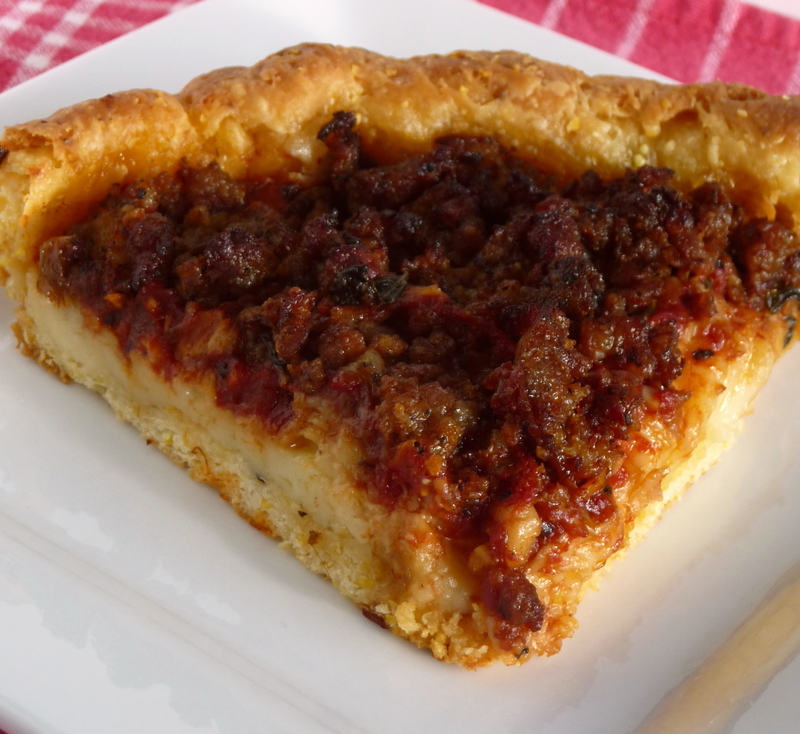 This base also can include parsley, bread crumbs, red chili flakes, anchovies, lemon juice, capers, or many other ingredients, depending on the region. time of day, and the chef. I posted about a combination that I did a few months back, Umami Linguine. A bit of butter, I find, in a sauce like this helps improve with the mouth feel and adds a bit of richness to the sauce without becoming heavy.